One of the best tourist destinations in Bangalore Whether you have just an hour for a quick smart-phone-app based self-guided tour, or several hours for a more relaxed and detailed tour, a visit to Omthara Kala Kuteera is definitely worth your while. 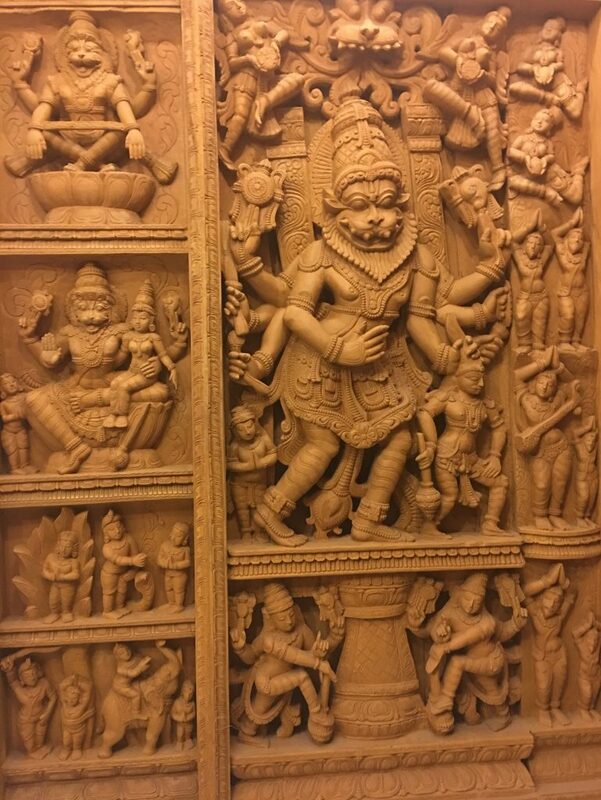 A sightseeing visit of Bangalore is not complete without seeing Omthara Kala Kuteera. Come over and enjoy India’s ancient culture, traditions and art. Reality or Mythology? To most Indians who are devoted Hindus and ardent followers of Sanatana Dharma, captivating stories of gods and goddesses from Hindu scriptures that predate recorded history, are accounts of what actually transpired in eons before our time. To others, those who are less rooted in faith and perhaps more skeptical, these are myths that were masterfully crafted to ensure that society is rooted in faith and embraces good values. Whatever they may be, reality or mythology, there is no disputing that the thousands and thousands of fascinating stories in the Hindu scriptures, which have no single author, have been amazingly woven together, and correlated geographically to actual places in India, and chronologically synchronized with each other to make perfect sense. Individually and together they represent some of the biggest epics that the world has ever known. At Omthara Kala Kuteera you can get a tiny glimpse into these amazing stories, and enjoy the day learning about them through visual and performing arts. Come see the Dashavatara Sound and Light show that takes you into the mythical past of the various avatars of Lord Vishnu. 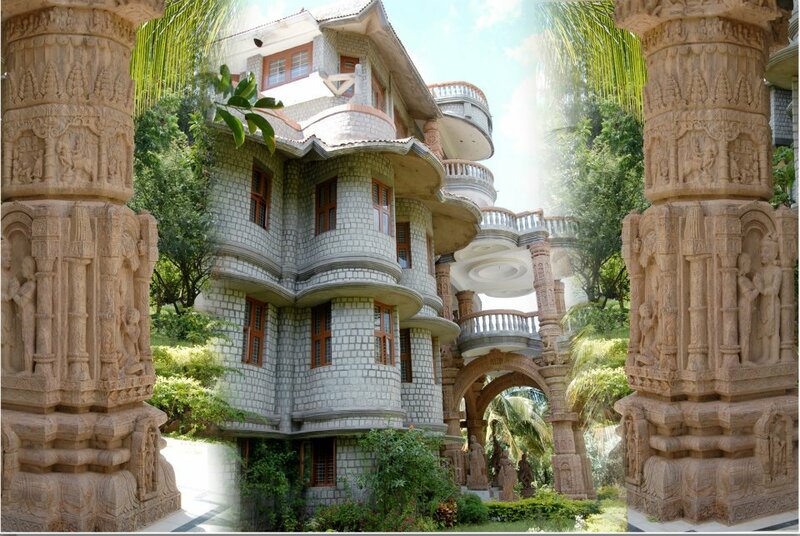 Enjoy the fascinating stories of Lord Krishna through stone, stucco and wood sculptures. Get to know the travails and triumphs of Lord Rama that are intricately sculpted into the Ramayana stone panels. Find out how and why Lord Srinivasa came down to earth and is now in Tirumala. See the ascetic Lord Shiva as a family man along with Goddess Parvathi, Lord Ganesha and Lord Muruga. Enjoy the Amrutha Mryuthyunjaya form of Lord Shiva. See how Lord Shiva, as Dakshinamurthy, enlightens even the most learned sages. A primer on Sanatana Dharma is incomplete without getting to know Shakthi, the Mother Goddess. See the amazingly beautiful form of Mother Gayathri, who personifies Parabramahan, the one supreme divinity, and includes in her the trinity of Bramha, Vishnu and Maheshwara, as well as the trinity of Saraswathi, Lakshmi and Parvathi. See the various forms of Goddess Parvathi. As Mother Annapurneshwari she feeds and nourishes the world, as Mother Durga she protects the world, and as Mother Kali she annihilates evil in the world. See the Ashta-Lakshmi forms of Goddess Lakshmi. Through various forms of wealth, she enriches the lives of all beings. Sanatana Dharma has influenced philosophical and spiritual thoughts way beyond India’s borders. Through Buddhism, which many Hindus consider to be an offshoot of Hinduism, because many Hindus believe that Buddha is one of the avatars of Lord Vishnu, Sanatana Dharma has extended its influence to the far east and westwards also. See and learn about the various incarnations of Buddha. 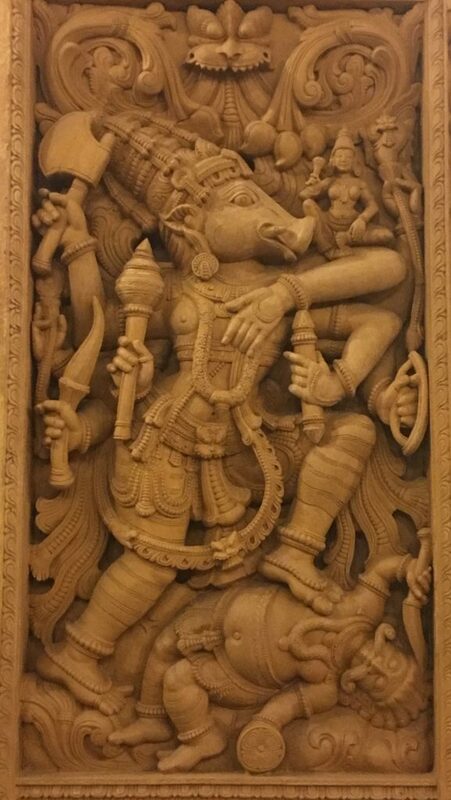 These are sculpted in stone at Omthara Kala Kuteera. Art at Omthara Kala Kuteera To art aficionados, Omthara Kala Kuteera is heaven sent. It is an endless buffet that you can slowly devour to your hearts content. To others, it is an amazing place, bedecked with art, that you can get pleasure out of by quickly sampling the various items that are displayed. Art at Omthara Kala Kuteera includes – Wall and ceiling frescos, miniature paintings, oil paintings, vegetable dye paintings, and gilded paintings studded with semi-precious stones – Wall to ceiling and wall to wall sculpted panels made of stone and wood depicting stories from various Hindu epics; pillars and arches that are made of sculpted stone; and life size statues made of stone, stucco, wood and bronze of gods and goddesses; – To those coming in for conducted 5-Star Visitor events, a visit to Omthara also includes a sampling of Indian performing arts, ethnic dance and music, from various regions of India. These include tribal arts as well as more refined arts from the schools of Karnatak music, Hindustani music, Bharatanatyam, Kuchipudi, Kathakali, Mohiniyattam, etc. – Built to resemble a lotus flower when seen from the top, the columns, arches, sloping roofs and wall curvatures in the Omthara Kala Kuteera building make it an art form in of itself. Activities at Omthara Kala Kuteera Sightseeing is the major activity for everybody at Omthara Kala Kuteera. Visitors who have signed up for our 5-Star Visitor program have an option to also participate in indoor and outdoor activites. Indoor activities include photoshoots in ethnic Indian clothing and ethnic Indian games such as Ashtapada, Chaupat, Pagadae, Pallanguzhi, Krida-Patram, Lambs and Tigers etc. Outdoor activities includes a ride on a bullock-cart, folk-dancing, and ethnic Indian games such as kabbaddi, kho-kho etc. Yoga and meditation sessions are also available for those that want to participate. Food at Omthara Kala Kuteera Café Annapurna is open to all visitors at all times. Non-alcoholic beverages and organic vegetarian food are served. Visitors who have signed up for our 5-Star Visitor program are provided special breakfast, lunch and snacks, as well as beverages throughout their visit. Quick self-guided tour, or a detailed conducted visit. Your preference? Book the visit of your choice to enjoy Omthara Kala Kuteera Self-Guided Tour: Download our Android app from the app store, or rent an Android tablet with the app already loaded on it when you come to Omthara Kala Kuteera. With the app, you can get detailed information on each of the exhibits. You can come in any day from 9 am to 6 pm for this self-guided tour. 5-Star Visitor Program: With 10 or more visitors signing up as individuals, or as group, we will schedule and conduct a special 5-Star program for you. Your visit to Omthara Kala Kuteera can be a lot more than seeing and learning about Indian art and mythology. Our 5-star Visitor Programs also includes performing arts – music and dance, Indian costumes, Indian board games, traditional Indian food, bullock-cart rides, yoga, meditation, and ayurvedic massages.